Alex Cora had at least two reasons to be happy Saturday. The rookie manager saw J.D. Martinez hit his 21st homer of the season and David Price turn in another strong pitching performance in the Boston Red Sox's 4-2 win over the Chicago White Sox in the second game of a three-game series at Fenway Park. But before the game even started, Cora was thrilled with what he saw in batting practice -- from Mookie Betts, his best player. 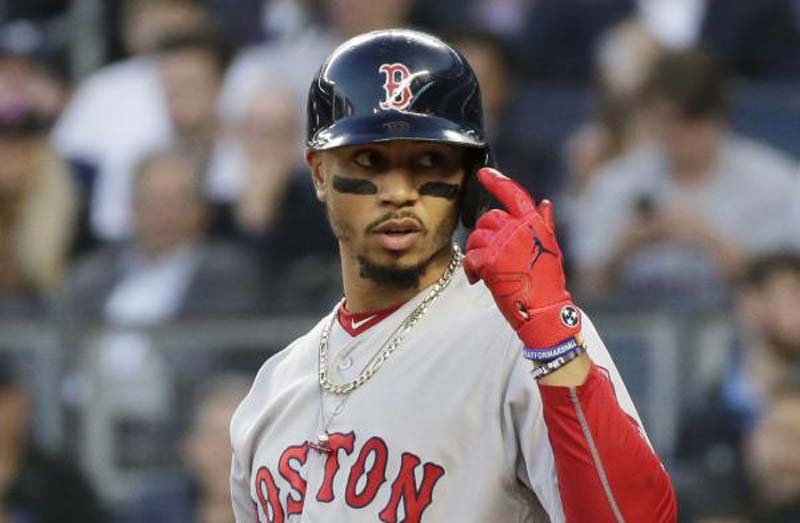 "It seems like now he's gaining momentum," Cora said of Betts, who is on the disabled list with an abdominal strain. "Hopefully, he doesn't stop throughout the day ... there was a lot of energy today. It looked like he was a lot better able to drive the ball. No hesitations. Hopefully, he can do it again tomorrow, and we'll go from there." Betts was eligible to come off the DL on Friday but will not make it back in time for Sunday's series and homestand finale. Rick Porcello will look for his ninth win of the year when he faces Chicago's Reynaldo Lopez. The plan is for Betts, who is batting .359 with 17 homers, 37 RBIs, a 1.187 OPS and 13 stolen bases, to play a rehab game before he returns to the Boston lineup. "It makes sense for us for him to, at least, before he comes here, to get a few at-bats, get his feet wet," Cora said. The manager was also happy with some other news Saturday. Reliever Tyler Thornburg, who has waited well into his second season in Boston to make his Red Sox debut, is close. "I saw him this morning," Cora said. "He felt good about not only his performance, but how he feels today. The plan is for him to pitch tomorrow. I think one off-day, pitch tomorrow, see how it goes, and we'll map it out for the rest of the week." Despite Saturday's win, the Red Sox remained a half-game behind the New York Yankees atop the American League East. In a normal first half of a season, Porcello (8-2) would be a decent bet to win his second Cy Young Award in three years. But this is the year of the great pitcher in the AL, with the likes of Justin Verlander, Corey Kluber and Luis Severino having monster years. Porcello, who was off to a great start, was struggling before winning his last two times out -- yielding two earned runs in both while going 6 2/3 innings in one and 6 1/3 in the other. The right-hander is 11-8 with a 4.35 ERA (159 hits in 142 2/3 innings) in 23 career starts against the White Sox, a division opponent when he was with the Detroit Tigers. He faces Lopez, who comes in at 1-4 with a 3.42 ERA and is 0-3 with a 4.86 ERA in seven road starts. His start comes after the Chicago defense sabotaged Carlos Rodon's first start of the season Saturday -- as the White Sox fell to 21-41. "Yeah, you got to roll with it. It's just the way it goes," Rodon said after striking out seven and allowing four runs (two earned) in five innings. "As a starting pitcher or as a teammate, you have to pick up your teammates. Those things happen. Do the best you can to get out of it, get out of the inning or the situation." Chicago's roster is a combined 24-for-78 (.308) with two homers and 11 RBIs against Porcello. Yolmer Sanchez is 5-for-12 (.417) and Avisail Garcia is 7-for-20 (.350), but he's on the disabled list. Lopez, 9-10 in his major league career, has never faced the Red Sox (44-21). Boston has won at least 44 of its first 65 games for the fourth time in team history and the first time since 1978.